About a million years ago, I was having a Mexican themed dinner for my gang of friends. As I always like to do, I made a bunch of different things with the intention of taking photos and sharing the recipes with everyone. I even came up with my own enchilada sauce for the occasion! 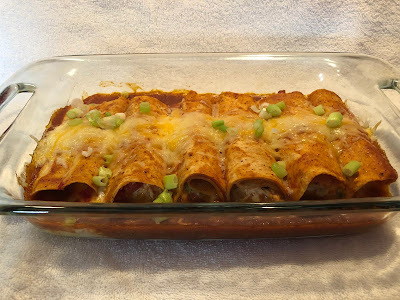 Well, somehow or other, the dinner happened, but the photos didn't, and ever since then I've been looking for the right time to make these fabulous enchiladas again so I could take a photo and share the recipe with you. Well, that time has FINALLY arrived! Don't they look yummy? 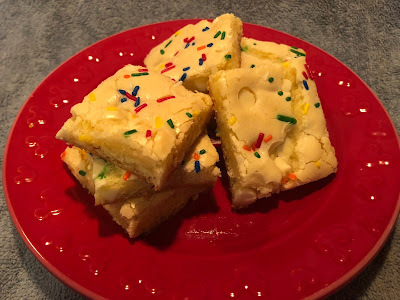 Now, usually, when I come up with a new recipe, it takes me a few tries for it to land exactly where I want it, but with this recipe, I think I landed it on the very first go. They're cheesy and gooey and saucy and savory and as spicy as you want to make them! You can even save time by assembling them ahead of time. I'd say they were definitely worth the wait. Pull the chicken off the bones and use a fork to shred. Set aside. In a sauce pan, saute onions, peppers, until they begin to soften. Add spices and continue to saute for a few more minutes. Add diced tomatoes and shredded chicken. Stir to combine. Remove from heat. Add about half of the shredded cheese. Stir to combine. Set aside. Coat the bottom of a casserole dish with enchilada sauce. Dip tortillas in enchilada sauce so that it is coated on both sides. Lay it flat on a plate. Fill with a big heap of the chicken filling, then roll into a log. Place each tortilla roll into the baking pan. Top with more enchilada sauce and the rest of the cheese. Bake for 35-40 minutes at 350ºF or until melted and bubbly. Top with sliced scallions. I like to serve it with a bit of sour cream on top and a little fresh salsa! I purposely didn't add any heat because I'd rather leave that up to you. What kind of heat do you like? You can add jalapenos or your favorite chilis to the chicken mixture with the other peppers. You can add crushed red pepper flakes or Tabasco sauce to the sauce. For a little smokey flavor, you can add chipotle peppers in adobo sauce to the filling. You can add Sriracha to everything! Choose your heat, choose the amount, or just leave it out! If you have burrito size tortillas instead of taco size, just cut them in half and proceed as directed. This sauce only takes a few minutes to throw together and it's absolutely the perfect thing for your next Mexican themed dinner. 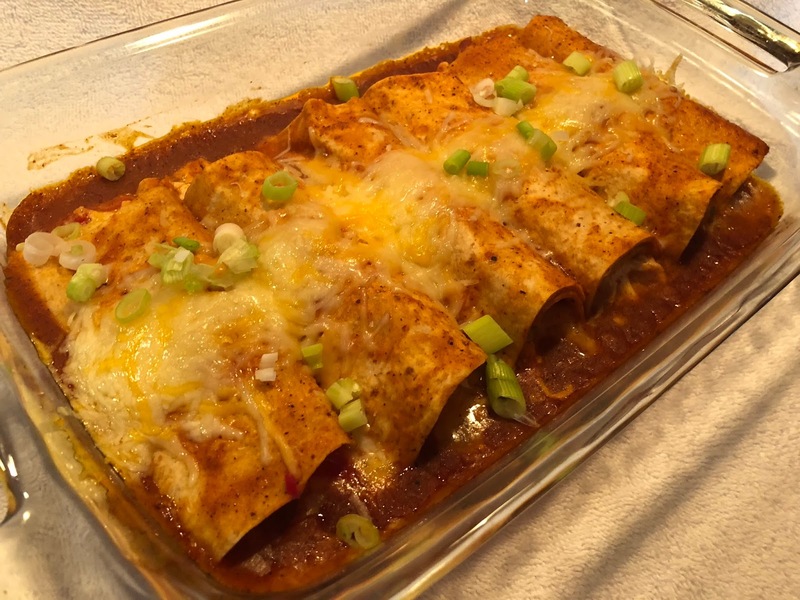 What kind of enchiladas do you like? Chicken? Beef? It goes with everything! It's my own recipe and I hope you like it! Oh, and if you wanna add some heat, go for it! Add oil and flour to a sauce pan. Over medium heat, whisk together to make a paste. Add the spices and whisk to combine. Add the chicken broth and tomato paste. Whisk again until smooth. Let it simmer for about 15 minutes. It should be a little on the thin side, not quite as thick as ketchup. If it becomes too thick, just add a little more broth. Adjust salt if needed. That's all there is to it! I like to measure all of the spices into a small bowl and then add them all at once. This way you're not burning the first spice by the time you finish measuring and adding the last one. If you don't have chicken broth, you can use powdered or cubed bouillon. Just omit the added salt. Or you can just use plain water. If you'd like some heat, add as much crushed red pepper flakes or cayenne pepper as you like!! Do you love avocados as much as I do? I love love LOVE them. It's absolutely not uncommon for me to just cut up a couple avocados into a bowl, sprinkle with some kosher salt, and there's lunch. But I must admit, as intriguing as it has always been, I've never used avocados in a dessert. Well, that is until now! I recently had a few friends over for a Mexican themed dinner, and I wanted to incorporate avocados somewhere in the menu. The usual thought would have been to make guacamole, but then I thought, hmm.. let's try something different! As usual, I did some googling, looking for ideas. I found several recipes for cheesecake and quickly noticed that they all seemed to be no-bake cheesecakes. Maybe the avocados don't do well with the baking? Who knows? But I went with it. It was as easy as throwing everything into a food processor and blitzing it until smooth and creamy! And OMG it's SO delicious! You can really taste the buttery avocado, and the tartness from the lime cuts through everything to make a very LIGHT and refreshing dessert. Who knew???? So, the next time you're looking for a "slightly outside the box" kind of a dessert, give this one a try. (it's from Kraft!) And it's a total time saver because you do it ahead and let it chill until you're ready. I bet your family and friends are gonna love it! Combine graham crackers and butter. Press into bottom of a 9" spring form pan. Process all remaining ingredients except Cool Whip in a food processor until smooth. Spoon into a mixing bowl. Fold in Cool Whip. Pour over crust. Smooth the top. Refrigerate four hours or until firm. Run a knife around the rim of the pan to loosen cheesecake just before serving. Remove rim. OK, I did a few things slightly differently. Instead of using graham crackers, I used vanilla wafers. Why? Because I like 'em! Also, I baked my crust for about 10 minutes at 350º because I wanted it to have more of a toasted flavor, then quickly chilled it in the freezer before filling it with the cheese mixture. And since I didn't want to ruin the nice smooth side edge of the cheesecake, I decided to spray the inside of the springform pan ring with cooking spray. No need to run the knife around! To decorate, I just piped some more Cool Whip on top, and then added some more fresh lime zest just before serving. Btw, one other thing.. this cheesecake softens to a very soft mousse when it is left out and comes to room temperature. Be sure to keep it chilled at all times! Are you looking for a dish that comes together in just a few minutes?? If so, I think I've found the perfect thing for you! Lately I've been in the mood for take-out Chinese food, but then I thought "Well, I have a wok, I can just make it myself!!" And frankly I could be enjoying a delicious dish LONG before the food would arrive anyway. So here we go! I found (and ever so slightly tweaked) a recipe for Sauteed Asian Broccoli, but then I wound up adding chicken and a few other veggies. Actually, I swapped out a couple sauce ingredients and changed a few of the amounts too. Wait, actually, I didn't cook it the same way either. Anyway, this is where I landed! And honestly, it turned out so perfectly, I immediately made another batch, just so I would have leftovers! It's SO tasty!!! And seriously, it cooks so quickly, it's literally ready in less time than it takes to cook the rice. Now that's what I call a perfect week night meal! Even if you don't have a wok, give this recipe a try. Just use a big saute pan! For an even speedier time, you can prep the chicken and veggies the night before! Heat the oil in a large pan or wok over medium-high heat until shimmering. Add the veggies and stir to coat in the oil. Add a few splashes of water. Cover and let the veggies steam for about 3 minutes, or unto most of the water has evaporated. Add the chicken and frequently give everything a good stir. In a small bowl, mix 1/4 cup water, soy sauce, cornstarch, brown sugar, and garlic. Whisk to combine. Immediately add to the wok and stir to coat everything for about two minutes or until sauce thickens. Drizzle with toasted sesame oil. Serve over rice. Top with a sprinkle of sesame seeds and serve. The original recipe called for crushed red pepper flakes. I wasn't feeling the spice, so I omitted it, but if you're all about the heat, go for it! Be sure to use just a TINY drizzle of toasted sesame oil. It's only meant to be used as a flavor enhancer, and a little goes a very long way! If you like a lot of sauce, just double all of the sauce ingredients! For extra delicious rice, saute a small chopped onion in a little bit of oil, then add your rice to the pot. Instead of adding water, add chicken broth. Then cover and finish cooking as directed. You won't believe how delicious white rice can be! If you know me, you know that one of my favorite things to do is to cook dinner for my friends. It's a great way to test any new recipes I want to try, and most times my friends are all too happy to be my taste testers. Most times I'll choose a theme, and very often we'll watch a movie that goes with it. This was basically how it came to be for this dish. We decided to watch The Princess and the Frog, so of course I needed to make a big pot of gumbo! Now, as far as I can tell, Gumbo in New Orleans is like Sunday Gravy with Italian Grandmothers. Everyone has a cherished family recipe, and of course each one is labeled The Best. So how does one choose the DEFINITIVE gumbo recipe? Basically, I just did what I always do. I looked at several recipes, decided which one is closest to what I had in my head, and then tweaked it to how I like it. I knew I wanted to start out with a roux (pronounced as RUE), which is just a mixture of fat and flour. Some will argue that it's not a gumbo if you don't start with a roux, so who am I to question it? I also knew that I wanted it to have chicken and sausage in it, and I also wanted it to include okra. 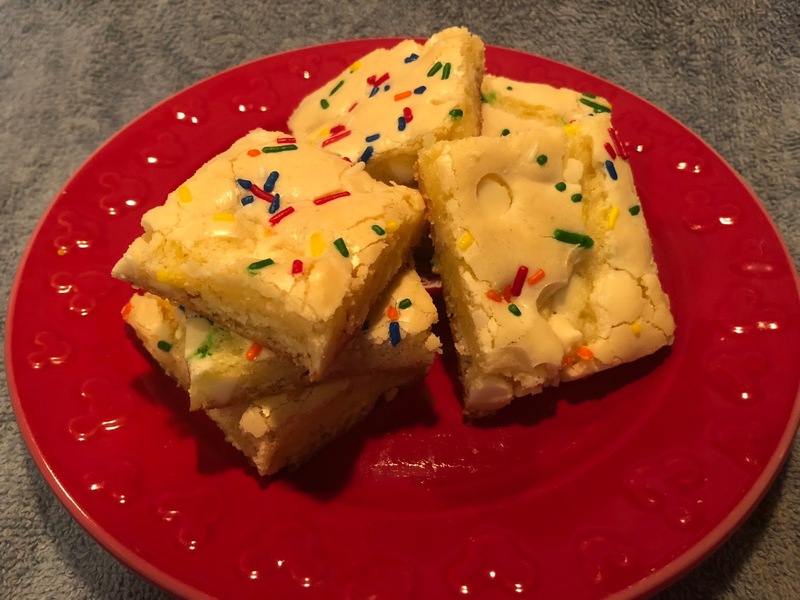 This recipe from Valerie Bertinelli seemed to hit all the right notes, so here we go! It was basically as easy as throwing everything into the pot and letting it cook! I have to say, I think this is one of my very favorite things that I've ever cooked. Like, in the history of ever. And honestly, that's kind of saying a lot! It's SO flavorful, you can make it as spicy or mild as you like, and it can feed a crowd! It was the perfect thing to serve to my gang as we watched Princess Tiana and Prince Naveen. It should also be noted that Kelsie, in particular, was a HUGE fan, and still asks me all the time to make it again. OK, Kelsie, Kels, I promise I'll make it again soon!!! Even if you're not having a New Orleans night, you should still give this one a go. It's just so good! Warm 1 cup oil over medium heat in a large Dutch oven until hot. Add the flour to the pot all at once, whisking until the consistency is uniform. Cook the roux, whisking occasionally, until it is the color of a tarnished penny, about 20 minutes. Do not let it darken any further. Carefully add the celery, bell peppers, onion, chopped scallions and garlic to the pot, working away from you as the hot roux may spatter. Stir until the onions begin to soften, about 5 minutes. Add enough stock to just cover the vegetables, about 1 quart, and stir to combine. The roux may separate. Add the tomatoes with their juices, Andouille and smoked sausages, cayenne, bay leaves, 1 1/2 tablespoons salt, 1 tablespoon black pepper and the remaining stock, about 1 more quart. Partially cover and bring to a boil, then reduce the heat and simmer 20 minutes. Meanwhile, heat the remaining 2 tablespoons oil in a medium skillet over high heat. Add the okra and cook, stirring, until the gel dries out slightly, about 3 minutes. Add to the Dutch oven. Taste the gumbo for seasoning and adjust as desired. Add the chicken, cook until warmed through and serve, or simmer up to 2 hours more to concentrate the flavors, adding the chicken 20 minutes before serving. Sprinkle with more chopped scallions and serve over rice. It's very important to cook the roux before you add anything else. Some recipes just cook it for a little while, other recipes cook it until it's REALLY dark, almost black. I decided that it doesn't need to be completely black to give a deep rich flavor. Be sure to saute the okra before you add it to the pot because this helps to get rid of that distinctive stickiness. Actually, I also browned the sausage in the pan for a little bit before I added it to the pot, just to add a little deeper flavor, and then I used the same saute pan to cook the okra. Ok this is one of those recipes I've always heard of, but never really considered trying. But lately it seems that I keep hearing about pickled eggs. I saw them on The Kitchen, and even heard someone mention them in a tv show I was watching. 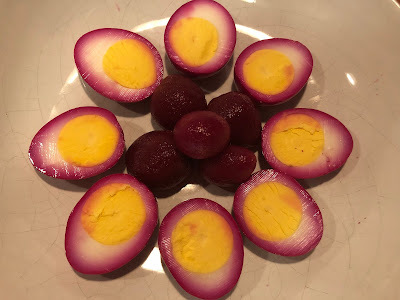 When I was growing up, my Mom always made pickled beets (which I've always LOVED), but she never did them with eggs. Then my brother, Chris, mentioned them so I figured Ok, ok, apparently the Universe is telling me I should make them, so let's give 'em a go. OMG they're so good!! Yes yes, I know pickled eggs are considered "pub food" because apparently they go really well with beer, but I like them just as is. Also, they turn such a pretty color that they they're the perfect thing as a party appetizer. And they get darker and darker the longer you let them pickle. I'm not gonna lie, I'm kind of a little bit obsessed with them now. Who knew they'd be so tasty???? Making pickled eggs is definitely an old-timey sort of thing to make, but I definitely think it needs to make a comeback. Who's with me?? Drain beets, reserving the liquid. Place beets and eggs in a 2-qt. glass jar. In a small saucepan, bring the sugar, vinegar, and reserved beet liquid to a simmer until the sugar is dissolved. Let cool slightly. Pour over beets and eggs; cool completely. Cover tightly and refrigerate for at least 5 or 6 hours before serving. To Hard Boil the eggs:Place eggs in a saucepan and cover with cold water. Bring to a boil. Cover the saucepan and remove from heat. Let the eggs sit in the water for 15 minutes. Remove egg from saucepan and place in a large bowl of ice water. Or you can just purchase eggs that are already hard boiled! Some recipes call for the addition of water. I don't like to dilute the vinegar. I'd rather have a stronger pickling solution, but you do you! I like to let them pickle for at least 24 hours, but you can get away with just 5 or 6. They will last at least a week, probably up to 2 weeks in the fridge. (Honestly, they will will probably be gone long before then anyway! )For a little extra flavor, add a little thinly shaved slices of onion to the jar. You could also add a little pinch of cinnamon, ground cloves, or pickling spice.For a festive and pretty appetizer use your pickled eggs to make deviled eggs and top each one with some chopped chives. Yum!